Published: April 2018 - Pan Macmillan. Genres: Adult / thriller / contemporary. Amos Decker and his journalist friend Alex Jamison are visiting the home of Alex's sister in Barronville, a small town in western Pennsylvania that has been hit hard economically. When Decker is out on the rear deck of the house talking with Alex's niece, a precocious eight-year-old, he notices flickering lights and then a spark of flame in the window of the house across the way. When he goes to investigate he finds two dead bodies inside and it's not clear how either man died. But this is only the tip of the iceberg. There's something going on in Barronville that might be the canary in the coal mine for the rest of the country. Faced with a stonewalling local police force, and roadblocks put up by unseen forces, Decker and Jamison must pull out all the stops to solve the case. And even Decker's infallible memory may not be enough to save them. Just as a small disclaimer, I haven't read the previous books in this series. 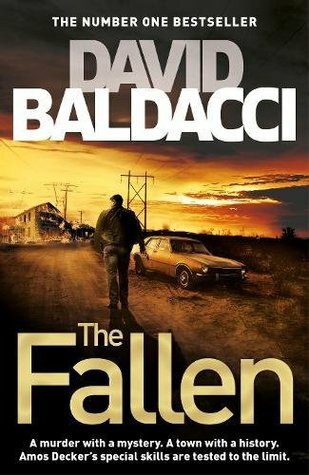 Actually, this is my first Baldacci novel altogether. So I'm sure that some aspects would appear stronger?? if I'd read the previous books. The writing is distinctive and incisive, with an undercurrent of dry sarcasm. The descriptions - if any - are extremely sparse, and I actually love how lacking in exposition the style is. The tone is strong without excessive details and explanations. It's easy to read. The dialogue, however, is slightly disappointing. It's often superficial, and the melodramatic one-liners at the end of chapters that serve as cliff-hangers, are a little eye-roll worthy. But I do love that characters' personalities still come through, despite the brisk and informative style. The plot is exciting and fast. There's not a lot of action, but it's tight and keeps moving, enthralling you from start to finish. The only negative is that the mystery aspect is rather overladen. I love the protagonist, Amos Decker. He's startlingly original with quirks and a staunch personality, and although I don't like how he always has the right answer for everything, I still find him likeable. He's not egotistical, which makes the difference. Amos is great. But everyone else is lazily written and not fleshed out. Zoe is the only character (apart from Decker) whom I actually liked. I also really really wanted Alex Jamison, as Decker's partner, to be a bigger part of the case. As it is, she simply asks the questions and Decker always has the answers. She contributes nothing, except being related and emotionally tied to two other characters involved in the case. I wish she'd had more to do with it. I wish her character was actually necessary. The Fallen is a quick, enthralling, and deftly written thriller with a unique protagonist. Perhaps if more time had been spent on the characters, it could be a superb novel.